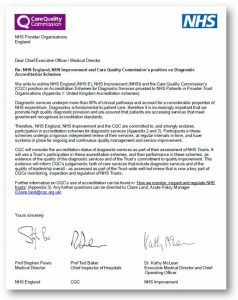 NHS England (NHSE), NHS Improvement (NHSI) and the Care Quality Commission (CQC) have recently written to Chief Executives and Medical Directors of all NHS Trusts to demonstrate their commitment and endorsement that all diagnostic services should seek UKAS accreditation. Given that diagnostic services underpin more than 80% of clinical pathways and account for a considerable proportion of NHS expenditure, they see it as fundamental that patients have access to services that meet government recognised accreditation standards. The CQC states that it will consider the accreditation status of diagnostic services as part of their assessment of NHS Trusts. It will use a Trust’s participation in these accreditation schemes, and their performance in these schemes, as evidence of the quality of the diagnostic services and of the Trust’s commitment to quality improvement. This evidence will inform CQC’s judgements; both of core services that include diagnostic services and of the quality of leadership overall - as assessed as part of the Trust-wide well-led review that is now a key part of CQCs monitoring, inspection and regulation of NHS Trusts. UKAS provides accreditation for Pathology Laboratories, Imaging Services (ISAS), and Physiological Diagnostic services (IQIPS) and is currently developing accreditation for Medical Physics and Clinical Engineering (MPACE). In order to support Trusts through the accreditation process and to meet the NHS England expectation, UKAS provides a range of assistance. Further information can be found on the Health & Social Care page.